Ask for the Sale the Right Way, Okay? First off, let’s drop the mindset of “asking” for the sale. Mentally, I feel this sets us up for failure. In my mind, I’m going to take one of two approaches. First approach is the one I like best for B2C. “Invite” the customer buy. Second approach is for B2B, where my preferred style is to “tell” the customer what the investment is going to be. Let’s break these apart. In the B2C situation, inviting the customer is akin to inviting someone to a party. You’re inviting them to participate in something they will enjoy. Customers don’t want to be “sold.” In fact, the days of hard sell closing tactics are long gone. Customers are smart. 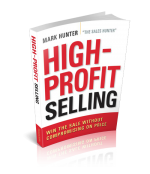 They are wise about the approaches salespeople use, and when they feel they’re being “sold,” they shut down for fear the salesperson will take advantage of them. Businesses don’t “buy” anything, because everything they supposedly “buy” is really helping them achieve something. This is why I say businesses don’t buy anything, but they do “invest.” A business will invest in anything as long as they see a return on their investment. Investing rather than buying applies to everything a business purchases, regardless of how they use it. You might think they’re “buying” office furniture, but really they’re “investing” in office furniture, because they need to keep their employees productive. Those productive employees ultimately make the business money. You can substitute anything you want, but it’s the same – businesses invest, they do not buy. When looking to close a B2B sale, we need to frame it in our mind and ultimately the customer’s mind that the investment they’re going to make will achieve the return on investment they expect. Customers don’t resist buying because your price is too high; they resist because you haven’t created enough value in their mind to allow them to see the return on investment. Let’s apply this same “investment” approach to a B2C sale. Yes, it holds true here too. The only difference is many times the return on investment is an emotional gain in the mind of the customer. They are investing in that emotional gain, whether it’s security, relief of pain, enjoyment or a host of other feelings. They aren’t buying. They are investing. You ask what is the right way to ask for the sale? It’s simple: You either “invite” or you “tell” by showing the return on investment the customer will receive. PrevPreviousDoes Your Personality Come Through with the Gatekeeper?